How do you know how well you're performing if you have nothing to compare it to? 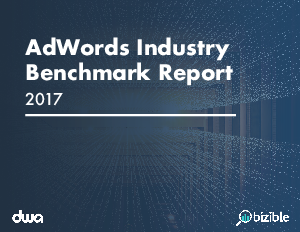 The 3rd annual AdWords Industry Benchmark Report, made in collaboration with DWA, includes data from over 200 companies on critical down-funnel performance metrics, like revenue generated, ROI, and more. The industries covered in this report include: Agency, Business Services, Education, Financial Services, Hardware/Manufacturing, Software/SaaS, and Telecommunications. Download the report now to see how your paid search performance compares with industry peers.